Do You Want Cheap, Fast, & Great Graphic Design? Colin Harman is an artist in California who created a graphic design infographic a few years ago that is so simple it begs you to insert your own interpretations, graphic design stories, and client experiences in each one of its carefully placed Venn diagram intersections. No matter your bent in the graphic design world, from freelancers to corporate employees, we’ve all dealt with clients who have been astute, clueless, or somewhere in the middle. 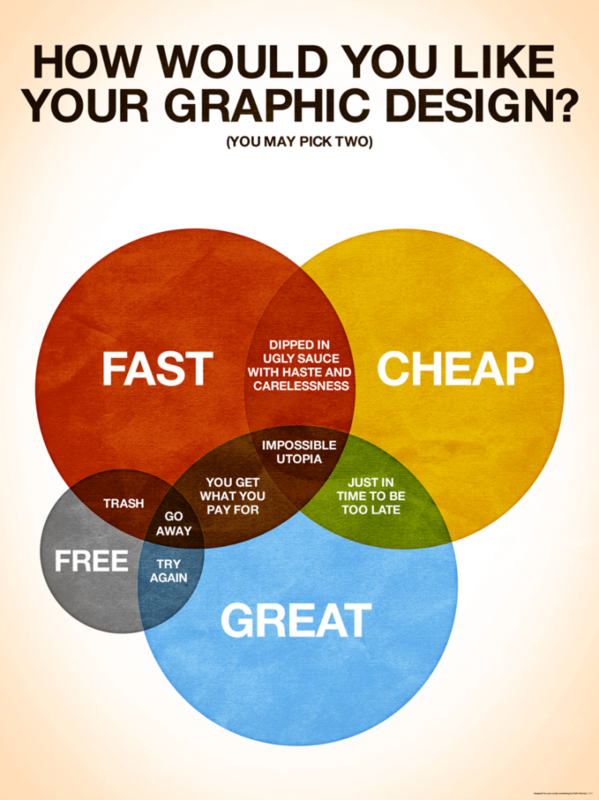 What the graphic designer understands is you can’t have it cheap, fast, and great. The burden falls to us, the designers, to provide the client with reasonable expectations on a job by job basis. The great graphic design infographic below can be used as a simple tool to help communicate expectations to a client. The infographic speaks for itself, but as I stared at it, I kept thinking about eggs. The color used for the cheap area of the diagram might have reminded me of yoke which led me to think of scrambled eggs. Scrambled eggs are the fast and cheap of the egg world and will serve as the analogy for the same in the graphic design process. Outside of sucking the yoke straight out of the shell, it’s the fastest way to make eggs. Scrambled eggs are also the cheapest way to have eggs because there is no skill involved and you can have them served this way just about anywhere so it must be cost effective. I know what makes scrambled eggs is the same thing that makes deviled eggs, but skill has value in the cooking world, just as it does in the graphic design world. As the Venn diagram shows, fast and cheap graphic design gets you ugly, quickly and sloppily: read scrambled eggs. Hard boiled eggs take the longest to make, can be the basis for thousands of recipes and other uses, and let’s face it, the outer shell can either reveal the goodness underneath or you can dye it to create beauty on the outside. Such is the same with great graphic and web design. Design of any kind takes time so we can eliminate the fast section of our Venn diagram below. You cannot put a clock to inspiration or quality. Graphic design should not be cheap as there is no set price for creativity and imagination. And there is always a cost for greatness, therefore it cannot be free. Great graphic design is like the hard boiled egg: it takes time, it’s value is endless, and when done right, it will always yield greater results than might initially appear. Eggs sunny-side up are my favorite. I couldn’t leave them out. While I won’t use the method to describe graphic design, I felt like I should use it to describe how graphic designers should approach and communicate with clients during the design process. Positive. My “favorite” client line, as mentioned in another of my blogs, is, “I’m not a designer but…” Usually what follows this Captain Obvious statement is something that makes designers literally or figuratively roll their eyes. Take a deep breath and soak in this truth for a moment. The clients are not designers, that’s why they hired you. Use the opportunity to create a positive relationship with the client and use some of the language in this graphic design infographic. Fast, cheap, easy, and great are all words you can use to communicate to the client what the expectation level should be for what they are demanding of you. Are you going to have to do something under-the-gun for little money? Magic Eight Ball says, “Signs point to yes.” As long as you’ve communicated to the client what to expect in a positive, “sunny” way, then all should be well. Graphic design is art. Art is subjective. Even the title of the infographic is a perfect representation of subjectivity. How would you like your graphic design? It even suggests one can pick two. Design your heart out given the parameters of each job and communicate the expectations of your work within those parameters positively to your client. And have some eggs while you’re at it, however you may take them. I completely agree… And I find the egg analogy amusing. Thanks for the commentary Beejay. Based on your experience, what other suggestions can you make for communicating expectations effectively to the client other than what the post suggested? Great article! I’d like to add that whenever clients pay for fast or cheap designs, they also get unoriginal content. There’s either not enough time to put the effort and thought in creative, outside the box design, or the lack of motivation to put the effort in designing great art (cheap). Thanks for the comment Yung. How do you suggest communicating to the client reasonable timelines and expectations for quality work at a fair price? Bottomline is, you can’t have a great graphic design for free. You can have a great graphic design fast, but don’t expect much. Great and cheap graphic designs are feasible, if only you don’t have a deadline to beat. To have a great graphic design, one must really spend for it and give the designer an ample time to finish it. I love the egg analogy, by the way. Thanks for the feedback Alex! How do you communicate to your clients about setting reasonable deadlines and expectations of quality? I think this is definitely true in any industry. Take any service or product, and ask the consumer what are the top three things they want in a transaction to get said service/product. I haven’t done the research but I would be willing to bet Cheap, Fast, and Great are some of the top expectations. This “impossible utopia” of expectations may be a never-gonna-happen scenario, but if you (any business) effectively communicate what can or cannot be done in comparison to the clients expectations, the client will likely feel that they had all their expectations met. Thanks for the comments Rex. I think far too often service providers get to the delivery stage of a product and get frustrated when the client balks, when if the burden was initially put on upfront communication, both parties can walk away happy with the results. I like scrambled too, but you’re right, I won’t look at them same. Love the analogy of the egg on communicating of expectations. When I meet with clients I will tell them that we are not the cheapest and not the most expensive and we that pretty much will fall in the middle. However, that does not mean you will get average work because if you are not satisfied we will make the necessary fixes to meet your expectations or give you your money back! Dave, this is a good point. No matter what time frame or price point we work out with our clients, we still have to provide the best possible product or service because ultimately it is our quality that will bring them back. Thanks for the comment! Good article. It’s funny how the graphic by Colin Harman is applicable in many different occupational fields. On a more personal note, I would have loved to have had the graphic when doing chores around the house for my parents. Dad, I can mow the yard or clean my room fast, and with the amount you give in my allowance, cheap, but the job’s going to be dipped in ugly sauce with haste and carelessness. Good thought, Brian. Much like Beejay’s dad’s sign, the “impossible utopia” is hard on any level or age. Very interesting article; as a software engineer in a multidisciplinary group it hadn’t occurred to me that graphic designers are effectively a variation on my day to day. I’m surrounded by engineers of varied disciplines and it’s a never ending task to explain the balance of time, effort and cost that goes into each project. I’m constantly saying “Do you want it right or do you want it fast?”… I think this graphic will be my go to from now on. It’ll be on my door at work in the morning! Good thoughts Matt. Just put a piece of tape over the words Graphic Design in the title and write with a sharpie, “Software Engineering”!